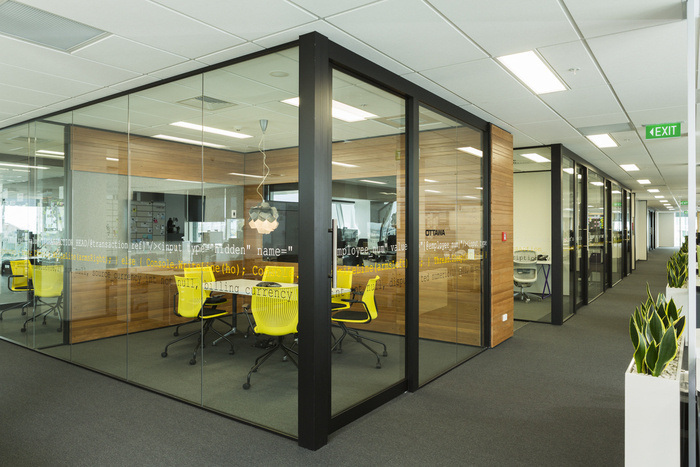 AECOM has developed a new office space for Spendvision located in Auckland, New Zealand. Working in partnership with some of the world’s leading banks, financial organisations, corporates and governments, Spendvision is a leading innovator in the world of Transaction Management. During 2013, growth in New Zealand saw Spendvision look to consolidate multiple office locations into a single local headquarters. They now occupy the top 2 floors of 8 Mahuhu Crescent. 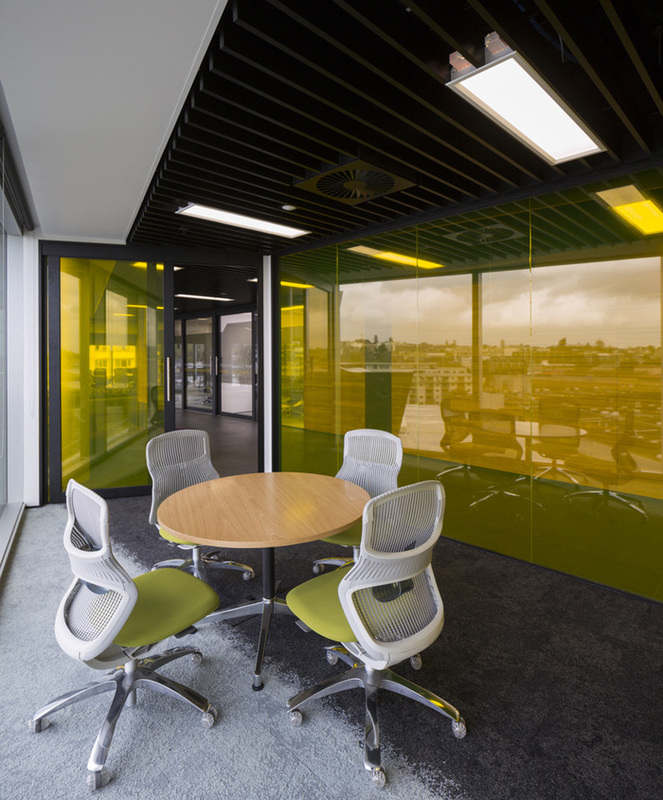 The planning strategy employed ensured that hard fit out elements were located immediatley adjacent to the central core, leaving a flexible zone, or racetrack, around which workspaces can be added as and when required, with individual workspaces enjoying good proximity to natural light. All staff were to maintain a 1:1 desk ratio with ample provision of shared space from the informal ‘scrum’ boards, to 1:1 quiet rooms and workwall zones. 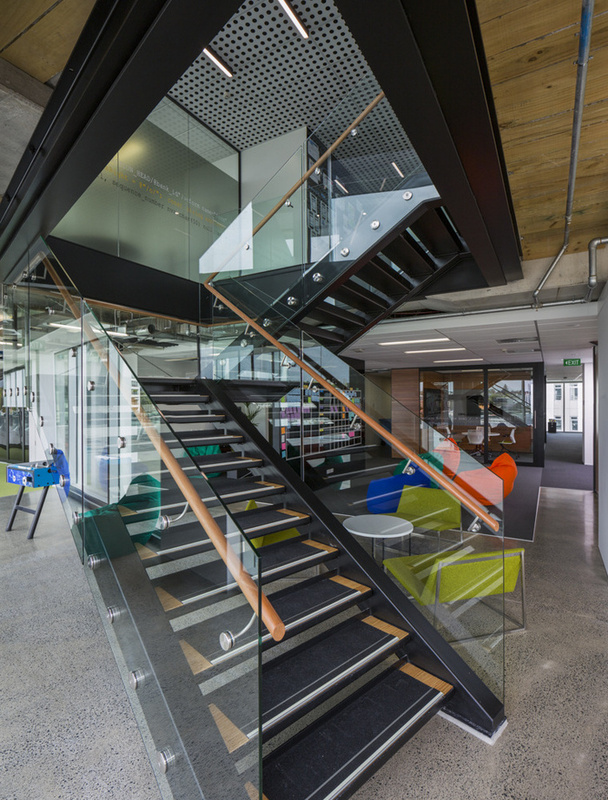 A key factor in helping to encourage a unified culture was AECOM’suggestion of introducing a tenant stair. This stair connects the staff café in the north-east corner of level 6 with level 7. Finishes in the café are deliberatly industrial, with a polished concrete floor and exposed services / structure overhead to ensure the space is differentiated from the main workspace. Shared breakout spaces accommodate foosball, table tennis, a gaming lounge, a ‘library, the café (complete with home brew machine), the deck area with putting green, swing ball and a future petanque court. Visitors are met by staff on level 7 where they either wait in the lounge, or are taken to a meeting room. 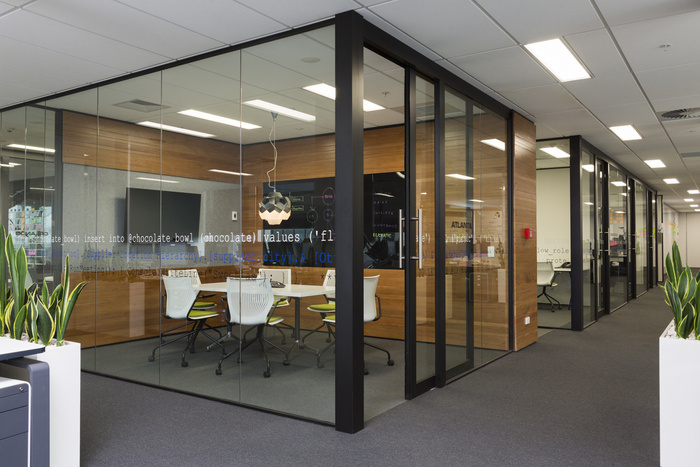 This area is finished in Totara clad wall panels, Italian ceramic floor tiles, and a black open aluminium louvre ceiling that incorporates the base building light fixtures. AECOM sought to incorporate subtle reference to the services and products that Spendvision represents. This is evidenced in glazing manifestation which is the result of in house coding competitions. The continuous lines of code which run through the 2 floors tell a story, and the odd in house joke. The new workplace environment supports a wide variety of workstyles from introverted coders, to marketing & sales professionals, to a help desk. The unique requirements of these users has been accommodated, while not compromising the primary objective, which was to improve business functionality and foster a unified culture for Spendvision.